WaveFormer Pro is a revolutionary new rapid-prototyping EDA tool that helps you design faster and with fewer mistakes. WaveFormer Pro enables you to automatically determine critical paths, verify timing margins, adjust for reconvergent fanout effects, and perform "what if" analysis to determine optimum clock speed. WaveFormer Pro also lets you specify and analyze system timing and perform Boolean level simulation without the need for schematics or simulation models. When your timing diagram is complete, you can then generate digital stimuli for your favorite Verilog, VHDL, SPICE or gate-level simulator. 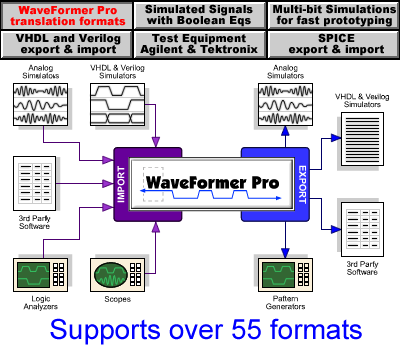 WaveFormer Pro also has the ability to import and annotate simulation and logic analyzer data, for publication quality design documentation. "I use SynaptiCAD's WaveFormer Pro tool to perform not only graphical timing verification and documentation but to also simulate in real time the logic I will be generating in VHDL..."
"Waveformer Pro has been easy to use and exactly the tool that today's design engineer needs to include as part of one's design methodology...."
"Creating reports of all the timing violations would have been totally impractical without WaveFormer..."
Got a question about WaveFormer Pro and HDLs? Call 540-953-3390 and ask for Gary. He will give you a brief tour of WaveFormer Pro and cover important areas like: drawing waveforms, creating multi-bit buses, documentation techniques, import and export capabilities, and basic simulation features.